If you're tired of motels and hotels during your longer stays in Florida, try Jensen Beach Vacation Rentals. Enjoy Florida in the comfort and style only afforded with the space and amenities of a vacation property at Jensen Beach, Florida Accommodations. If you are seeking beaches, waterfront or quiet island surroundings, allow yourself to be pampered. Dock your boat and fish in the canal in your Jensen Beach vacation rentals backyard; walk the beaches at sunset; swim in your own pool; cook in the kitchen; snack when you want; watch TV and relax in the comfort of your "home-away-from-home" at Jensen Beach, Florida accommodations. 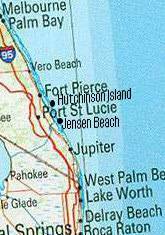 Jensen Beach, Florida lies just 5 minutes southeast of Port Saint Lucie on the Indian River. From this location it is approximately 90 minutes to the Kennedy Space Center and less than 1 hour to West Palm Beach. The ever popular Jonathan Dickinson State Park is just 15 minutes south and bike and hiker's trails through rare south Florida hills are all around. Pick your spot and settle in because it's all available from the homes, villas and condos in Jensen Beach vacation rentals.